Swimming pools, elaborate waterfalls, and custom in-ground spas are wonderful outdoor living amenities, but they can be an expensive undertaking. When for a fraction of the price, a portable hot tub, a.k.a. 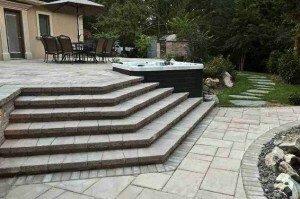 spa, can elevate the appearance of any backyard — with comparatively little effort and expense. 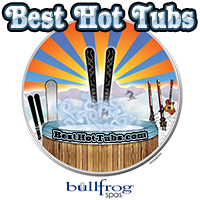 This is because, like any water feature, a hot tub brings movement and tranquility to any outdoor landscape when not in use. Not to mention, all the in-spa fun it offers with family and friends. If you are happy with an existing deck or patio, a portable spa can easily be set right next to it — if the elevation of your property allows. No special custom work is required. All that is needed is to set the spa on a firm, solid, flat surface (cement is most common), synthetic concrete, pea gravel, pavers, railroad ties or other options. Most homes offer multiple sites where a spa may be installed. 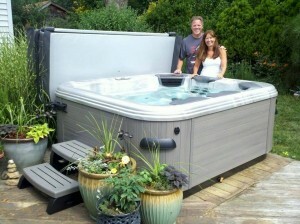 What If You Want a Special Hot Tub Installation? When you consider how much you save choosing a hot tub over a swimming pool, etc., some clients decide to upgrade their patio or deck — and have it custom designed to accommodate a new hot tub. 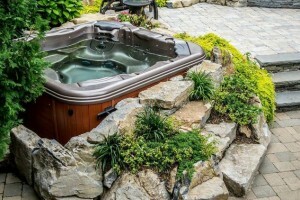 Best Hot Tubs has frequently worked with landscapers to make a new hot tub appear to be custom-set in a patio or deck — when it actually is set on the ground — with part of it exposed for easy access to the spa plumbing. Depending on what that requires, we collaborate with established landscaping firms in the area to ensure their new patio or deck and hot tub fit harmoniously together. Here’s another example. These homeowners already had a new upper and lower patio — and a swimming pool! They wanted to be able to use their spa all year long and didn’t want it connected to their pool equipment. So we set their new portable Bullfrog Spa between the pre-existing raised and lower patios. Boulders and plantings were added to give it a set-in-garden look. 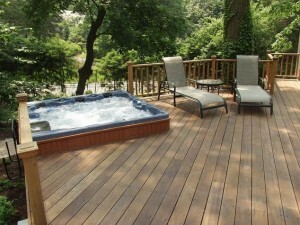 For this special deck installation, our team worked with The Deck and Patio Company (Huntington Station, NY). Deck and Patio designed and built an attractive raised deck, making room for a spa to be set against it. Sometimes when the deck is raised, a spa cradle (mount) is custom-built to lift the spa up to the height of the deck. That was the case here. 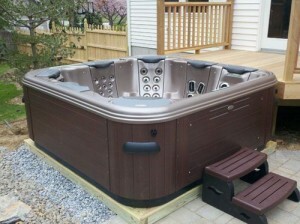 Whether it’s a simple — or more elaborate — installation, a hot tub brings the magic of a water feature to your backyard. It brings it the easy way! And for a lot less money than many other water features.